Without servitors, associates and paraphernalia, the Lord’s position is Brahman where there is no action. There is no feeling, willing, action, or thinking. That is the plane of nirakar nirvvisesha, non-differentiation. The activity of the transcendental world is positive, whereas, the activity of this mundane world where we are living is negative. We need to leave this mundane world with the help of the positive current, and that help comes to us in the form of our Guru-parampara. A light bulb requires both negative and positive electricity to light up. When there is darkness, we can think what light is, and in this way our program for being rescued from the mundane world is going on. Narada Goswami gave a conception to Vyasadeva, who then engaged in proper contemplation and attained realization. Bhakti-yogena manasi, samyak pranihite ‘male apasyat purusam purnam mayam cha tad-apasrayam (Srimad Bhagavatam 1.7.4) There are two kinds of maya: Yogamaya and Mahamaya. In Yogamaya, Krishna is playing in His transcendental pastimes, but Mahamaya is the illusion we are at present. Here is the only the activity of Mahamaya, illusion, but sometimes it may be possible to receive some help from that. There are many things to be known in transcendental knowledge, but Sri Chaitanya Mahaprabhu simply instructed, “Chant the Mahamantra and then you will realize everything.” Only by properly chanting this Mahamantra we will see everything. Similarly, Narada Goswami spoke only four verses to Vyasadeva, called Bhagavata Chatur-Sloki, and through meditation upon those verses evolved the Srimad Bhagavatam of eighty thousand verses. For our benefit it has appeared in this mundane plane by the grace of Srila Vyasadeva. Srimad Bhagavatam is a manifestation of Sri Krishna. The whole body of Srimad Bhagavatam is Krishna’s Body. In the Srimad Bhagavatam, and in other Scriptures, we find that the main instruction is to to chant the holy names of the Lord. This is a very nice thing, and the chanting of this Hare Krishna Mahamantra is our only hope. In this way we can go to our transcendental destination, and we can attain everything. Also, if we preach about that Mahamantra to others, we shall be benefited. When someone will practice, others will see that practitioner’s life and must be inspired. In this way Sri Chaitanya Mahaprabhu wants to take all the jiva-souls from all over the world to the transcendental world. There are countless numbers of jiva-souls, and if the world were to be emptied, more would immediately come to refill it, just as the wind rushes into a depression. This is one kind of pastime, lila, of Krishna. By His will everything is moving. The transcendental world is always very happily moving whereas the mundane world is moving unhappily. Everything is gachchhatiti jagat which means it is always moving. There is jada jagat and chetana jagat: the material world and the transcendental world. Everything, everywhere, is moving. This wall is moving , this light bulb is also moving and within a hundred years we will be able to see how they have changed their form. Jagat means ‘world.’ There are the transcendental worlds and the material worlds-everywhere, and inside everything, always some activity is going on. The proper work is service to Krishna, and the whole transcendental world is fully engaged in His service in many ways. There are many avataras, many manifestaions of the Lord. There are many things in the transcendental world and it is called purna– full. We have this birth in our hand and we shall try to utilise it properly to go into transcendental service world. To properly use it means to chant the Hare Krishna Mahamantra, to serve the Vaishnavas, and to always try to improve our devotional practicing life. Everybody is trying to make his heart clean, no doubt, but we must get problems with our human body; however, these we shall try to ignore. We have many diseases but we are not to run behind these diseases, rather we shall try to run with our conception of Srila Guru Maharaja. In this way we must all try to proceed. First there is practicing life, and only later will the higher knowledge come to capture us. When the higher knowledge conquers us, He will play in His own way. But we are practitioners, therefore it is most important that we try very hard to practice, otherwise we will not get that fortune. It is necessary to practice without offense and in that way we will quickly be successful. It is a very easy thing and also a very hard thing! No doubt it is a very hard thing but if we can follow under the guidance of an expert, it is also a very easy thing. 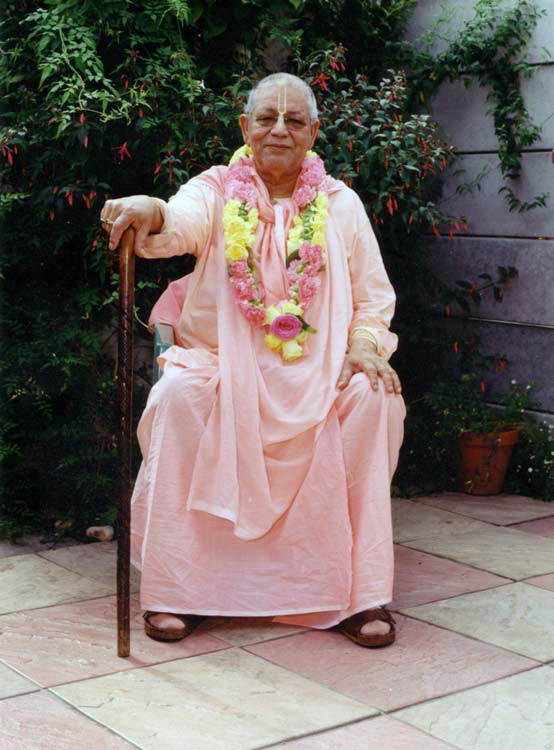 I have mentioned that when I joined Srila Guru Maharaja’s mission he gave me only one advice, and I think that this is the first and the last advice of Srila Guru Maharaja. He told me, “You must follow my directives not your mind.” When we are unqualified, we have no knowledge about the transcendental world. Therefore we have to expertly try to follow our Guru; and Guru must be perfect. 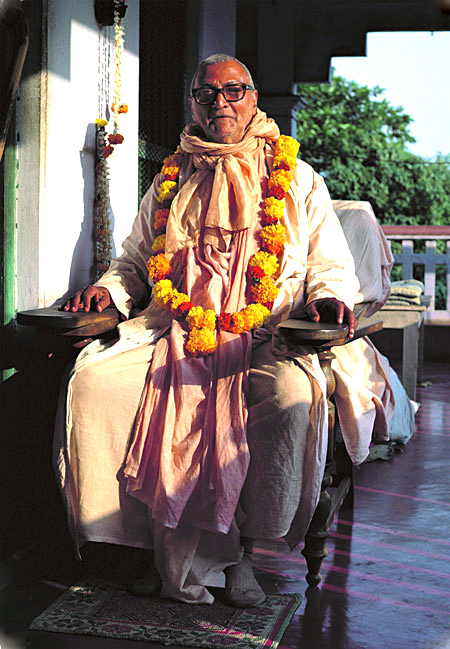 Before accepting Guru I may examine him in many ways and pray to Nityananda Prabhu to show His real form as my Guru. But once I have accepted someone as my spiritual instructor, Guru, then I must follow him properly. Nityananda Prabhu is the treasure of Vrindavana and so we must pray to Him, that means to our Srila Guru Maharaja who is non-different from Srila Nityananda Prabhu, and He must be merciful to us and give the opportunity to stay in Vrindavana Dham. Vrindavana Dham is here in a hidden way in Navadwip, and here at Koladwip is Gupta Govarddhan, hidden Govarddhan Hill. He who wants to see, can actually see this. By following a pure devotee, sadhu, we can achieve everything. Sometimes living with a sadhu may not be good for us due to the chance of our making offenses, but if we are far from sadhu but thinking about him and serving him, then that is sometimes better for the conditioned souls. The name I have given to Srila Guru Maharaja’s Samadhi Mandir is “The Temple of Union in Separation.” Union in separation is the highest life in the spiritual world. When Krishna is with Radharani and the Vraja Gopis, he is eating, playing, etc. When he is before Radharani, She sees only one Krishna, but when He is out of Her vision, She sees Krishna Everywhere: many Krishna’s. One who sees the presence of Krishna everywhere is a Mahabhagavat. Everywhere, in every matter and in every service, he feels Krishna’s presence. In good matters, in bad matters, in everything and everywhere the Mahabhagavat sees Krishna. He is a paramahamsa. He feels the presence of Krishna and sees the play of Krishna. All this is mainly coming via the channel of union in separation. That is the highest goal of our spiritual life. Mahaprabhu said, nayanam galad asru-dharaya vadanam gad-gada-ruddhaya gira pulakair nichitam vapuh kada tava nama grahane bhavisyati “Oh Lord, when will my eyes be adorned with tears of love, flowing like waves? When will my voice tremble with love, and when will my body thrill to the chanting of Your Holy Name?” When we shall take Krishna-nama properly then these feelings must come to us and we will be able to see the play of Krishna. Krishna will dance upon our tongues. We cannot chant properly now, but when suddha-nama, the pure Name, will appear on our tongues, He will dance and then we shall be able to feel everything: hrdaya haite bale jivara agrete chale sabda rupe nache anuksana I must make myself as a platform for the dancing of Krishna-nama. We must try in that way, and we shall be able to see that all the trees and all the paraphernalia of this Navadwip Dham and its Math of Srila Guru Maharaja are transcendental: we shall be able to feel that. These transcendental feelings are necesary, and when they appear they will not leave our heart. We may be trying mundanely now, but we must try with whatever we have. If we are able to run, we may try to win a 100 metre race. But now our legs are very weak. We cannot even walk properly, and are therefore taking the help of this mundane earth. We are taking that help like a baby who is trying to move by first taking help of the earth. But when we gain strength in our legs we shall be able to run, and after practicing at 100 meters we can try for 400 metres or 1500 metres or even the marathon. 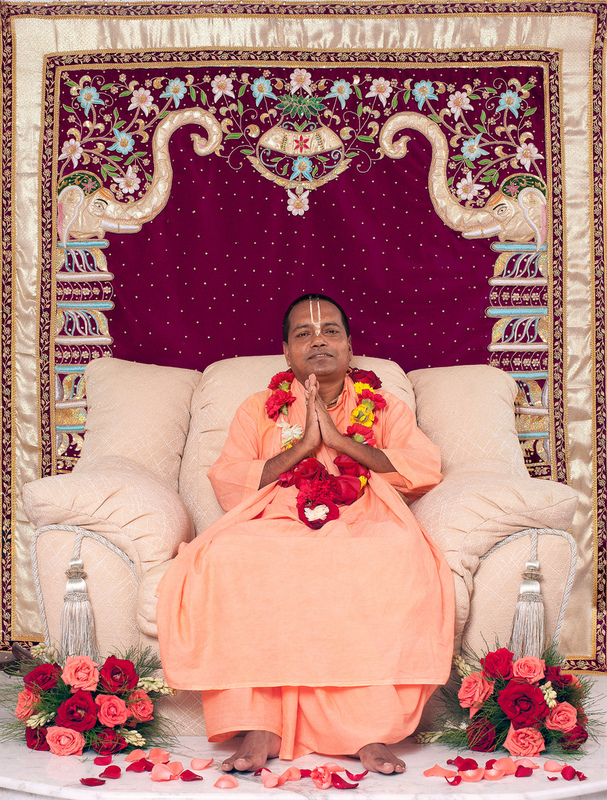 With the association of the devotees we can progress in our spiritual lives very quickly . A real devotee can give us everything. With his association we shall get many things and a “living life.” Life is not dead matter, but living life is necessary, indriyani parany ahur, indriyebhyah param manah manasas tu para buddhih buddheh yah paratas tu sah (Bhagavad Gita 3.42) If we can engage proper intelligence for the service of the Lord then we must certainly be the gainer. Proper intelligence is necessary, and that comes with the association of devotees. Our mind is always going this way, that way and every way, but when we get the association of devotees we shall automatically and always talk about Krishna Consciousness; of that there is no doubt. Just now I was doing some other service, but when you all came here to me, automatically I immediately engaged myself in speaking about Krishna consciousness. Therefore we can see practically the benefit of associating with devotees. You also try wherever you are living to make the association of devotees, and you also will be happy.